North Idaho is a place of intense beauty, its allure touching the soul of all who pass through, many to return months, years, or even decades later to make this little corner of America their home. It is a land for all seasons�the cries of wild geese echoing across the valleys with the first cool days of autumn, the mountainsides ablaze with color, and a golden aura falling upon the land, reminiscent of life in a painting by Van Gogh. Then comes the still white wonderland of winter�a scent of wood smoke upon the air, and the little Victorian town of Sandpoint sparkling with lights like some Norman Rockwell vision of times past. As for the glorious reawakening of life each spring; that is a masterpiece of creation that only Mother Nature herself could paint. And, with the first hot days of summer, the lake and waterways beckon us forth to revel in this vast and pristine sun-soaked playground that is our home. But, whatever the season�summer, winter, spring, or fall�the very best place to appreciate the full extent of our region�s spectacular beauty lies just a few minutes drive up from Sandpoint to Schweitzer Mountain Resort, where one can view the postcard perfect panorama of Lake Pend Oreille spread out before us like some vast, shimmering turquoise jewel. But, this is just the beginning�a preview of things to come. The real magic awaits us higher up the mountain. But, before we explore further, we should take a little journey back in time. For, while the exhilarating experience of hiking, biking, boarding, or skiing upon the groomed slopes of Mt. Schweitzer is something we locals now take for granted, the story behind the resort�s founding is a tribute to the unwavering dedication of local winter sports visionaries� and the story of how Mt. Schweitzer got its name, a strange and fascinating little piece of local history. From the earliest beginnings of our region�s history, North Idaho has been home to an adventurous few willing to trudge up snow-covered mountainsides, tie hand-shaped wooden slats to their feet, and slide back down with as much a measure of grace as gravity and their crude equipment would allow. Fortunately, over time, both equipment and technique evolved. But, what never changed was these local ski enthusiasts� fanatical devotion to the sport, and burning desire for their own hometown ski hill�a dream finally realized in the mid-fifties, when a group of volunteers went to work clearing a wooded hillside two miles west of Sandpoint, rigged up a rope tow powered by the wheel rim of a jacked up car, and Pine Hill, the area�s first groomed ski slope, was born. Unfortunately, skiing conditions at Pine Hill were less than perfect. Even though the crude rope tow was soon replaced by a permanent two-chair lift powered by an old Dodge engine, the hill was not high enough in altitude to guarantee a season-long coating of snow, and a warmed-up car and thermos remained the only amenities skiers could expect following a run down the slope. And so it was that the locals continued to eye the snow-covered mountains of the region, and dream of someday having a real world-class ski resort of their own. Then, as the fifties became the sixties, two Spokane men, Dr. R.L. Fowler and Jerry Groesbeck, driving through our area on their way home from a ski vacation, stopped alongside the highway to stretch their legs. And, while staring up at the snow-covered peaks, as ski buffs are wont to do, their eyes fell upon a large natural bowl nestled high in the mountains above. It struck them then like a bolt of lightning. What they were looking at was untracked, natural perfection�just waiting for the hand of man to groom. From that moment on, the idea of bringing a ski resort to North Idaho became an all-consuming obsession for the two. They pooled their resources to buy the acreage encompassing the bowl, packed in equipment and provisions to establish a base camp at the foot of the basin, and began exploring the slopes to map out future runs. Fowler went to work cornering every ski enthusiast he could find to gain support for the project, while Groesbeck traveled from ski resort to ski resort, asking questions, and picking up all the information he could garner on operations and equipment. Bit by bit their dream evolved into reality. By 1961, work had begun on the ski runs and road up the mountain. Construction of the tubular-steel towers for the mile-long double chair lift began. Electric lines were brought up the mountainside to power the lift�s 150 horsepower electric motor, resort lights, and the heating cable that would melt the snow off of the lodge roof. A diesel motor was put into place for emergency backup. And, Canadian ski enthusiast Sam Wormington was hired as manager. By late fall of 1963, twelve hundred acres of the basin were groomed and ready with three 2,000� runs from timberline to the lodge, miles of trails, and parking for 500 cars. The Sandpoint News Bulletin devoted their entire weekly issue to the resort�s upcoming Thanksgiving Day grand opening. Renowned international ski racer Tammy Dix was set to christen the slopes with the first downhill run of the day. And, Idaho Governor Robert Smylie sent out invitations to dignitaries around the world, including two notables who shared the resort�s name, Pierre-Paul Schweitzer, then Chairman of the World Monetary Fund, and Dr. Albert Schweitzer, who had won the Nobel Prize for his humanitarian endeavors in Africa. A fitting gesture it would seem. For, the name Schweitzer does indeed evoke visions of grandeur and nobility. But, the truth of the matter is that the naming of Mt. Schweitzer had nothing to do with nobility, and is instead a bizarre little story that has woven itself into the fabric of Sandpoint�s colorful history, becoming a part of what makes this region the fascinating and wonderful place it is today. It was in 1892 that 35-year-old Ella Mae Farmin and her husband L.D. first arrived in Sandpoint to work as station agents and telegraph operators for the Great Northern Railroad. At that time, the little cluster of homes and business on the lake�s shoreline was known as Pend Oreille, and consisted of around 100 permanent residents, 23 saloons, 2 stores, 2 hotels, 1 restaurant, and several �houses of ill repute.� And, like many of the other outposts on the fringes of civilization, liquor flowed freely, and with the fall of night, the sound of laughter, curses, and gunfire filled the air. It was not unusual for a stranger to be seen entering a saloon, never to be seen again, presumably murdered, robbed, and body tossed into an empty boxcar or the deep waters of Lake Pend Oreille. One northward-bound settler and his wife wrote of holing up in their hotel room, where they spent the night praying for God to spare them long enough to resume their rail journey the next morn, so terrifying was the town�s wildness to them. Besides, the two pioneers had already fallen so in love with the region that they intended to spend the rest of their lives here, eventually becoming the founders of today�s Sandpoint. It was on a summer morning in 1893, while riding her well-mannered little filly, Nelly, to work, that Ella Mae first encountered a strange individual, dressed in some sort of well-worn military uniform, standing trailside at strict attention, musket at his side, as she passed. This went on for a few days, until one morning, he instead stepped out onto the trail, and taking Nelly by the reigns, led the pony about a half a mile along the path, before letting go and disappearing back into the woods. When she told her husband and son Earl about this strange occurrence, young Earl said that it sounded a lot like a �friendly old hermit named Schweitzer� who lived alone in a small cabin near where he and his friend Harry Nesbit liked to fish. This took the edge off of Ella Mae�s concern, but she took to running Nelly through that section of woods anyway. Then, not long thereafter, the man showed up at the railroad station during Ella Mae�s shift. Speaking in a thick Swiss accent, he informed her that he had come to seek her advice regarding his intention to kill a local settler, and take the settler�s wife as his own. Ella Mae made eloquent argument intended to dissuade the man from this plan, and after he had left, sent a warning to the settler that he was the target of a murder plot. The next morning, Schweitzer came back to the station to tell Ella Mae that he had decided to take her advice and not follow through on his plan, and that because Ella Mae was both younger and prettier than his other intended bride, it was his intention to carry her off instead. Unarmed and alone at the little station, and not a soul within earshot, Ella Mae decided to put on a front of bravado. From that day forward Ella Mae kept a six-gun alongside her bible in the drawer next to the telegraph machine, and L.D. immediately contacted the nearest railway agent at the Spokane office who, accompanied by the County Sheriff and a doctor from Rathdrum, arrived the following day to look into the affair. Upon entering the recluse�s cabin, located near where Bronx Road now crosses Schweitzer Creek, they found the hides of numerous cats nailed to the walls, and a pot full of cats boiling on the stove for the man�s supper, thereby solving the mystery of the recent disappearances of numerous of the town�s pets. Schweitzer was taken into custody, remanded to the �county farm� for observation, and later committed to an �insane asylum� where, as Ella Mae put it, �He lived out the rest of his life a dangerous and raving lunatic.�And, to this day, Earl and Harry�s favorite fishing spot has been known as Schweitzer Creek, and the mountain above, Schweitzer Mountain. Today the mountain that rises so majestically above the site of old man Schweitzer�s cabin has become home to a world class ski resort�the largest and most highly rated in the inland Northwest. This year, the skiing and snowboarding area was expanded to 2,900 acres, with the new Little Blue Ridge run offering an exhilarating 1.7 miles of continuous downhill skiing. There are now 9 different lifts taking skiers to the top, including: One high-speed six-pack named Stella; One high-speed quad; Four double chairlifts; 1 handle tow; 1 new T-Bar, and a new Magic Carpet� that will gently whisk beginners up to a gradual learning slope, without ever having to take their feet off the ground. There is no shortage of skiing variety either, with 67 trails, open bowl skiing, and 32 kilometers of cross country ski trails maintained daily. Neither is Schweitzer Basin a winter-only resort. With miles of hiking and mountain biking trails, huckleberry picking, and scenic chairlift rides, as well as a variety of concerts and other events, not to mention superb cuisine ranging from gourmet pizza to world-class dining, the resort has become a year-round destination for locals and visitors alike. And, no matter what the season, the view from the very top is nothing short of spectacular. 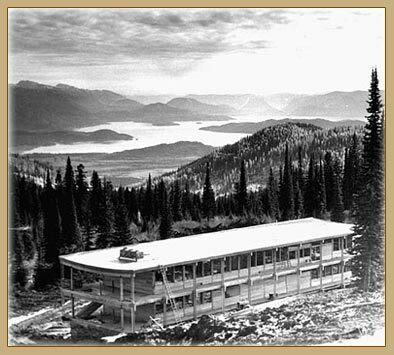 Once the realm of Hudson Bay Company �web men� who snow-shoed up the mountain�s steep slopes to trap marten for their luxuriously soft and thick winter coats, the exhilarating experience of standing at �the top of the world� is now easily accessible to all, thanks to a modern high-speed chairlift. a Kodak moment not to be missed.